"The table is one of the most intimate places in our lives. It is there that we give ourselves to one another. When we say, 'Take some more, let me serve you another plate, let me pour you another glass, don't be shy, enjoy it,' we say a lot more than our words express. We invite our friends to become part of our lives. We want them to be nurtured by the same food and drink that nurture us. We desire communion.... Every breakfast, lunch, or dinner can become a time of growing communion with one another." 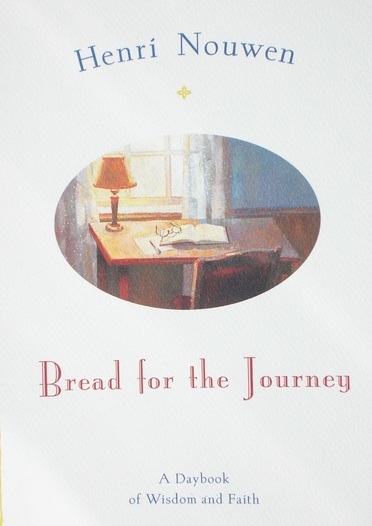 Intimately personal and inspiring," Bread for the Journey" is a daily feast of fresh insight into the challenges and deep joys of a life lived in close communion with God. Nouwen is a wise, loving companion who invites us along as he finds joy in the community of loss, true freedom in forgiveness of others, and hope in surprising places. Each daily meditation is a stepping–stone along a path of private discovery, offering Nouwen's seasoned yet fresh ideas on kindness, love, suffering, and prayer, the Church as God's people, and the importance of Jesus in one's life–reflecting, as a whole, Nouwen's own 'personal creed.' "Bread for the Journey" brims with daily nourishment and guidance for devoted followers and new friends alike –– food for thought on a yearlong journey of discovery and faith.